Do we really know who Stephen Hawking was? We know what he looks like and that he contributed much to science. But asking exactly what he contributed will likely leave people scratching their heads. The tributes may pour in and the text string that represents his name may “trend” on social media. There’s even this photo of him floating in the middle of a zero-g frolic that everyone is gushing about. But, really, I doubt if people can really answer the question of what Hawking really did to deserve his celebrity. He is a telegenic fellow who fits quite nicely into many feel-good new age narratives thanks to his disabled human frame and the formidable mind within it that made the earlier fact a mere footnote in his life’s story. Thus, despite the sheer inaccessibility of his ideas to the average person thanks to the baffling maths required to grasp these, Hawking has managed to bring elite science to the masses — or at least put a modern face to it. And those faces are far in between in the field of theoretical physics. When it comes to the sorts of physics and mathematics that serve as foundations for the ideas within which people like Hawking lived, there are arguably only two that come to mind to which Hawking added his as a third. Before him were Sir Isaac Newton who developed the first generation of equations used to calculate movements of bodies in space taking into account the effect of gravitational “force” on these and Albert Einstein who developed the theories and equations to explain those motions in the realm of massive bodies and near-lightspeed velocities where Newtonian equations break down. Over the first three quarters of the 20th Century, the theories developed by cosmologists like Einstein also laid the foundation for the development of theories that explain what are arguably the most famous artifacts of cosmology, black holes. Black holes are the massive objects in space that are so dense that light itself is unable to escape their gravitational pull. Thus the term “black hole”. Everything goes in, nothing comes out — at least until Hawking proved otherwise. Hawking proved that black holes aren’t really that black because they, according to his calculations, actually glow. Even more bizarre, he proved that black holes are, in fact, “evaporating”. How would black holes glow if light itself, according to generations of scientists that came before him, cannot escape their gravitational “force”? How could they be “evaporating” if supposedly stuff gets pulled into black holes but nothing can come out of it? Well, Hawking did not really claim that a black hole’s “glow” nor the matter lost to its “evaporation” comes from within it. So he did not break nor disprove any of his predecessors’ theories. Indeed, his black-holes-glow-and-evaporate assertion actually builds upon these theories. Hawking found that special conditions affect particle and anti-particle pairs that zap into existence near the event horizon of a black hole (the point-of-no-return that where stuff disappears from the visible universe forever). Normally these pairs annihilate (particle and anti-particle collide and cancel each other out) within a split-second of their appearance. However, at the event horizon, the anti-particle could be pulled across and into the black hole leaving the other free to wonder off into space. This freed particle is therefore emitted as detectable radiation while the anti-particle pulled into the black hole contributes to its loss of mass. Thus, under this theory (called “Hawkings radiation”) a black hole glows and evaporates. What is the practical value of Hawking’s theories of glowing black holes? After all, Newton’s laws served as the science behind everything from aiming artillery shells, to rocketing satellites into orbit, to launching spacecraft on trajectories to other planets. Einstein contributed to the development of nuclear energy and nuclear weapons but then also showed that there are limits to how fast and how far into space humans could potentially travel. Nobody know’s yet what Hawking radiation could open doors to. For that matter, I am not a big enough expert on physics to even say whether Hawking radiation was actually Hawking’s greatest contribution to science. For that matter, nobody knew at the time — not even Newton and Einstein themselves respectively when they formulated their theories — that a handful of differential equations would guide Apollo missions to the moon or that a simple algebraic one, E=mc^2, would both win a World War then go on to plunge the planet into several decades of Cold War. Perhaps it would help to put historical hindsight around the work of the earlier two men to understand where Hawking’s legacy could be headed. During Newton’s time it had already been established that the Earth and the handful of planets known at the time circled the sun in a predictable pattern. Newton then provided the mathematical bases to explain that pattern. Einstein lived at a time when more powerful devices were being developed to look deeper into space and, out of that, new patterns in the way objects were moving in space that did not quite fit Newtonian equations were being observed. Einstein contributed immensely the the science to explain those things too. Perhaps Hawking and the thousands of other elite physicists contributing towards humanity’s achieving an ever deeper understanding of the nature of the universe themselves do so in the context of today’s information age. This is in considering that the quantum computing is seen by many scientists and engineers as pathway towards the next big leaps in computing power. This holds promise when one then goes on to consider that it is increasingly becoming theoretically evident that at the most fundamental levels, time, space, and matter could be all underpinned by mere information constructs. The bigger point to be made here is that beyond regarding Hawking’s media-constructed celebrity, we should strive to at least understand the relevance and meaning of his work. Celebrating the life of Hawking that way will do his legacy more justice and will have made him even more proud of his immense contribution to humanity. How many Filipino people will remember Elon Musk? None. How many Filipino people will remember Manny Pacquiao? 1,000,000 or more! Well to be fair to Pacquiao, his work ethics and perseverance to make something of himself is something worthy of emulation. But apparently those are the aspects mostly overlooked by the casual fan. Actually, make it one to none. Back-riding Filipinos who arm themselves an easy way of name-dropping of western achievers from the first world is not a guarrantee that that is enough to have a sense of entitlement of achievement themselves. Just by doing so isn’t a right to think highly of oneself nor is it a license to undermine the rest. A Thinking Filipino is something to be, but the western dream and pride of a Pretending Filipino is almost always only about western-envy and colonial-mentality. Easy habit for some Filipinos to just brag about the achievement of the west and identify with it. But for more than anything else about the world has to offer, what matters more is how much more insight and interest in Filipiniana do you actually have within you or without you! “Oh the Filipino humanity!! !” The euphemism drags its double-edged ugly face also into the Filipino habitual poseurs! A great man of Science has recently passed away. However, the legacy of Stephen Hawking to humanity will be for generation to generation, to come. He was a British Theoretical Physicist, and an expert Cosmologist. He further explained to us, layman, the complexity of our universe. The Black Holes; the possibility of planetary travel in the future; gravitational forces in the universe;etc…Isaac Newton, started it,;Albert Einstein further explained it thru his Theory of Everything; Stephen Hawkins, further formulated it. Who will continue his work ? Anyone in our country, who is interested ? This is more interesting field, than politics. This great Cosmologist was stricken by ALS illness in his prime age. From there on, he was on wheel chair, and was talking with the aid of a Computer, with his neural system. 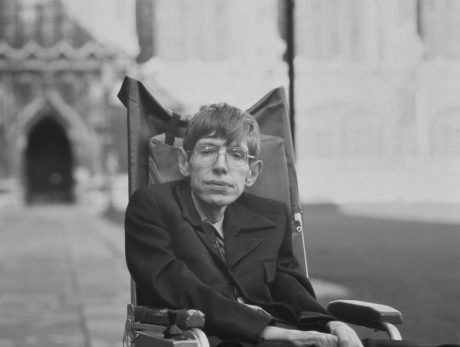 His disability, did not stopped him from his work, and from his love of Science. I often wonder why humanity tends to place more emphasis/attention to/focus on famous and rich people. There are loads and loads of people out there who are neither “famous or rich” according to worldly standard who have done enormous contributions to humanity and yet they’re UNsung, put aside, UNcared and forgotten. I see that we are, most often milking the wrong cow/barking the wrong tree in terms of humanity – human values. We rather value more on the physical, external, material and social rather than the internal and human and spiritual values. Whether famous & rich or not, we are dealing with/talking about humans who are trying to do better than their best, often times out of their physical, mental capacity and ability to make a difference and yet they are, in the end, able to do something for the sake of humanity as a whole. So if you are a famous and rich individual, you get the first row. Is this humanity, Sir?